With a background as a CPA and Chartered Global Management Accountant, Mr. Morrel is able to provide extremely knowledgeable counsel to clients. Among other accolades, Mr. Morrel has earned the Silver Pen Award from the Oklahoma Society of CPAs. In addition to careful estate planning, his experience allows our law office to assist with tax preparation and resolution as well as business matters and accounting. 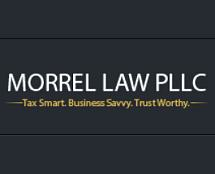 Mr. Morrel is a member of several professional organizations. These include the American Institute of Certified Public Accountants, Oklahoma Bar Association, Association of International Certified Professional Accountants, National Academy of Elder Law Attorneys and National Association of Estate Planners & Councils. He has authored numerous articles and books and regularly speaks in lectures and seminars. Morrel Law PLLC works with clients in the greater Tulsa metropolitan area. Our law office provides a free initial consultation. We take credit cards as an accepted form of payment.